Knoxville (population 3,200) located in western Illinois in Knox County, just outside of Galesburg. The community is accessible by taking either US 150 or Interstate 74, and was settled as Henderson in January 1831, before its name was changed to Knoxville in December 1832 when it was chosen as the county seat. Knoxville remained the center of the county until the county seat was moved up the road to Galesburg in 1873. The first county courthouse as well as an earlier jail still stand in Knoxville as testament to this early period, as does the county's Hall of Records, which doubles as the Knoxville City Hall. 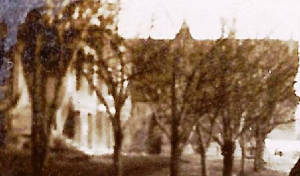 St. Alban's Academy for Boys was opened in 1890 by Rev. Dr. C.W. Leffingwell, who also created St. Mary's School for Girls in the city. The school was located in the building above, which was built for Ansgari College in 1876 for the education of immigrants from Sweden in the area under the direction of the Evangelical Lutheran Church. That school was a four-year college and offered a two-year course in theological studies as well as a two-year academy for high school-aged students. 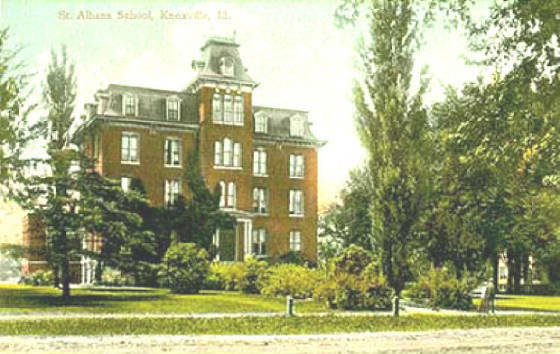 After its start in Keokuk, IA as an outgrowth of "The Mission Institute" in 1873, the school moved to Knoxville after the Hon. James Knox and Professor Charles Anderson raised more than $22,000.00 to build the building. Ansgari College did not last long and closed several years later, winding up in the hands of the city of Knoxville. St. Alban's occupied the building in 1890 as the Episcopal Church directed the daily affairs of educating young men that attended. Dr. Leffingwell was able to enlarge and improve the school as it grew. It is believed that St. Alban's remained in the building until the spring of 1919, when it moved to Sycamore in DeKalb County and took over Waterman Hall for Girls, which had closed the previous year. St. Alban's was closed for good in 1938 after financial difficulties and lack of enrollment forced its shuttering. We are certain the St. Alban boys competed in basketball and football. Given the period of history, it could be possible to believe that students at St. Alban's perhaps had baseball too. St. Alban's did have a gymnasium for basketball, which was used by Knoxvile High School and was the site of the Knox County Tournament in 1929. Unfortunately, the gym was where 30 people were injured when a newly-built balcony collapsed during the championship game of the county tournament. You can read more about this at the following link: http://www3.gendisasters.com/illinois/11391/galesville-il-high-school-gym-balcony-collapse-jan-1929. We are looking for more information about activities that St. Alban's may have offered to its students while it was located in Knoxville. Please contact us at the addresses listed below. The football photos were sent to us by Jo Ann Burr. 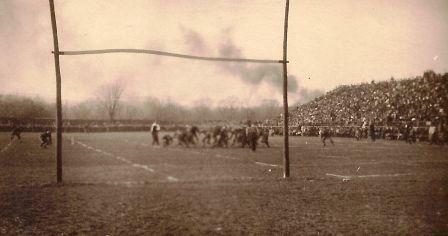 She tells us the photo is of her grandfather and of a football game played at Knoxville. Check out that crowd! !